A row has broken out over the decision by Billboard to remove Lil Nas X’s song Old Town Road from its Hot Country Songs chart. The song hit number 19 on the chart before it was removed. Billboard told Rolling Stone the song was removed because it “does not embrace enough elements of today’s country music to chart in its current form”. A remix of the song including Billy Ray Cyrus has since been released. 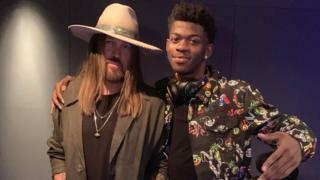 When news of Lil Nas X’s exclusion from the country music chart surfaced, Billy Ray Cyrus tweeted his support for the young artist. The country music legend said “only outlaws are outlawed” and passed on advice to the 19-year-old rapper to “take this as a compliment”. Old Town Road currently sits at number 15 on the cross-genre Billboard Top 100 chart, and had been viewed more than 23 million times on YouTube. The song rose to prominence after it went viral on the lip-synching app TikTok. It is not yet known if the reworked version will be eligible for inclusion in Billboard’s country music chart. In a Time Magazine interview about the controversy, Lil Nas X described the song as “country trap” and said it should be eligible for inclusion on both R&B and country music charts. The decision to exclude the track from the chart – and its absence from radio station playlists – was sharply criticised on social media. Four black men in total have ever topped Billboard’s Country charts with either a single, or an album. Darius Rucker, Kane Brown, Jimmie Allen… and as of last week Lil Nas X. 25% of black men to ever top Billboard’s Country chart have been removed. I live in Nashville. You don’t have to explain the racism to me. Country music is happy to appropriate but it doesn’t really want Black artists. Congrats to Lil Nas X for breaking through. While many people applauded Billy Ray Cyrus for lending his support to the younger artist, a number of social media users questioned why it was necessary for him to intervene. Lil Nas X should’ve never had to recruit Billy Ray Cyrus, as a form of validation, in an effort to prove/force Billboard to acknowledge his record as a “country” song. The controversy also started a conversation about the interaction between musical genres, and many pointed to other examples of country cross-over artist who have been listed on the country music chart. In the process of eliminating Lil Nas X from a genre and being the “gatekeeper” of country music, billboard actually made the lil homie bigger. You can’t stop progression. That song slaps. And it’s more country than anything Taylor Swift made, let’s be honest. If Lil Nas X isn’t country, then neither is Sam Hunt’s EDM or whatever it is Bebe Rexa is doing. If Rhinnon Giddens isn’t country, then stop pretending Florida-Georgia Line’s ouvre is.